•Designing and installing Automation in a home is still a technical process and cannot be done by the consumer themselves. Most typical electricians in India would lack the know how to use controllers and the programming involved to set up the protocols. •Products having good specs and finish are expensive: Some Global companies like Crestron have good solutions with excellent finish and technical specifications; however they are all priced beyond the reach of most Indian consumers. •Lower priced solutions have shabby look and build: Some Indian startups and companies have some offerings in the tens of thousands Rupees price points, which despite their compelling value offering, do not have a classy look and finish due to which they have not been embraced by the market. Follow this blog for further updates!! Multiple factors have contributed towards the growth of home automation, entertainment and security systems, namely the growth of smart phones, penetration of mobile apps, coupled with the rise in income levels of the middle class. The popularity of home automation and controls has been on the rise due to greater simplicity and affordability through connectivity using Wi-Fi-enabled devices such as tablets and smartphones. India is the fastest growing market for home automation. The industry has been witnessing an annual growth rate of 30-40 per cent. Given the burgeoning demand for electricity in India, conserving energy also becomes an imperative for the future. And herein lays the opportunity for automation systems, which control the basic functions of a home automatically or through remote access of a computer and improve the standard of living, while ensuring energy efficiency. The home automation market is worth about $300 million as of today and the growth potential of the sector has been pegged at Rs 20,000 crore ($3.2 billion) by 2020. In the current market, the surge of smart phone usage will contribute significantly to Home automation usage in the upcoming years. 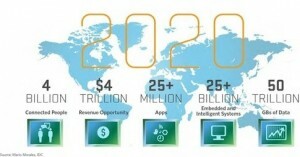 One of the main buzz words everybody has been mentioning in the last few years is the Internet of Things (IoT). The Internet of Things is the network of physical objects or “things” embedded with electronics, software, sensors, and connectivity to enable objects to exchange data with the manufacturer, operator and/or other connected devices based on the infrastructure of International Telecommunication Union’s Global Standards Initiative. IoT will allow objects to be sensed and controlled remotely across existing network infrastructure, creating opportunities for more direct integration between the physical world and computer-based systems, and resulting in improved efficiency, accuracy and economic benefit. The Internet of Things revolves around increased machine-to-machine communication; it’s built on cloud computing and networks of data-gathering sensors; it’s mobile, virtual, and instantaneous connection; and they say it’s going to make everything in our lives from streetlights to seaports “smart.” IoT devices can be used to monitor and control the mechanical, electrical and electronic systems used in various types of buildings (e.g., public and private, industrial, institutions, or residential). Why is Home Automation still expensive in India? The current Automation systems are developed by MNCs such as ABB or Schneider which are highly upmarket products (in their build, finish and positioning), you could argue that India is not the primary market they’re aiming to serve, so any such product you procure will most likely have been imported. The organizations that make these have massive overheads/R&D departments that need to function for these materials to be developed and refined over time. After all, you don’t question why bottled water costs 1000X of what it should cost, or why any FMCG product costs 25X of what it should. Thirdly, home automation systems are still a nascent field in India and there are several Indian firms which are aspiring to make much more affordable products keeping in mind the spending habits of the Indian buyer segment. Give it a few years and you’ll see Home Automation products across all price categories and segments. Our New & Recharged FB page!! We have updated our Facebook and Twitter pages to bring you the latest in Home Audio, IOT and Autmation related news from the world over, follow & like us on Facebook and Twitter for some great offers and discounts on our services! 2. Home Automation is still an expensive product, by Indian consumer standards, and there’s a lot of scope of the prices to be whittled down by an order of magnitude at least in the next few years. This will happen as more Indian companies manufacture the key components of Automation systems (controllers, Gateways etc) and economies of scale takes over. Deciding on a Theme: Once the room has been finalized, a contractor can help you with the theme, colour combinations, as well as seating layout for your theatre. The possibilities here are limitless, and you can pretty much choose any combination you want as your final look. You also have to consider acoustic panels; Using patterned fabrics or decorative print material, these panels will add an edge to your theatre’s look besides enhancing the audio effect. 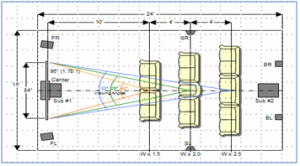 Blueprint/Diagrams: This is the step where your architect or contractor lays out the blueprints for the room specifying the dimensions and specifications for the construction of various elements of your home theatre. As you can see in the sample plans, every minor aspect has to be included here to ensure perfect execution of the theatre. Some little details you’ll want to check at this stage are if you have any special requirements, maybe a custom wood panelling directly into one of your walls, the design proposal has to encompass these aspects. Wiring/ Panelling (Framing)/ Drywalling: Once the design is complete,Wiring is completed for all locations (speakers/AV receiver/Projector/Screen), while contractors simultaneously work on the wood panelling (over the concrete walls) or drywall installation and also the multiple layers of flooring (raised seating levels for recliners at the back etc) in the theatre. Insulation & Acoustics: The insulation material (to be discussed further in the next article) is now added along with the carpeting, and inspections are made to ensure minimal sound escapes the confines of the theatre, and also that the audio quality is optimal. Installation of speakers/AV equipment: All the speakers/Woofers/projectors/other fancy AV equipment you have purchased will now be slotted into their positions and tested. When is the best time to call a Home theatre expert while constructing your home? Simple Answer: The earlier, the better. Planning for your home theatre during the blueprint stage itself allows you to dedicate a room for the theatre and ensure proper wiring/cabling/wood work/Finishing. However, if you’ve already ventured partway into construction, then don’t fret; we can still re-work on a bare room that has been partially/fully constructed. If you’d rather have an expert design and deliver the best Home theatre solution for your home, do speak to our experts in any of our experience demo centres in Bangalore (JP Nagar, KR Puram or Sanjaynagar). For address and contact details, visit www.thasmai.net and check out our great budget personalizer as well! It’s time to dispel a commonly held notion; that the most important component of your theatre’s auditory experience is the brand of speaker you purchase! While it’s true that buying a high performing speaker can greatly enhance your Theatre’s audio quality, the sound from the speakers is only a fraction of the overall sound ‘effect’ in the theatre. The room itself plays a vital role in the final sound you hear from the speakers, this is where you will encounter an important term- Acoustics. refers to the interaction of sound waves with the room’s surfaces, the final sound you hear combines the direct sound that travels straight from the speakers to your ears, and the indirect sound — the sound from your speakers that bounces off the walls, floor, ceiling and other material in the room before finally hitting your ears. All the objects react differently to different frequencies of sound depending on what material they’re composed of, and their shapes. Hence, every speaker system will sound different in different room setups.When sound hits a surface, some of it is absorbed, while some part of it is reflected &some is transmitted through the surface itself. 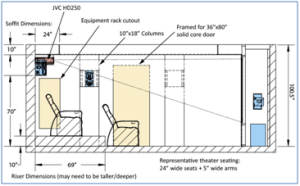 Do not confuse Acoustics with sound proofing, the latter deals with minimal sound loss/shrinkage from the Theatre itself, but Acoustics deals with how to best get optimal sound within the Theatre. Acoustics mainly deal with reducing/eliminating echoes in the room, as well as managing different frequencies to give you the best sound for that room. Typical Acoustic treatments involve using absorption material like Foam or Wool, and Diffusers, and keeping a balance of smooth surfaces with uneven material/designs to ensure sound travels evenly to all parts of the room, and avoid emphasizing one range of frequency while damping out the others. In general, the design should have about 50-60% of the surface area – wall, ceiling, and floor area, absorptive, most of these absorptive surfaces should be in the part closer to the screen. 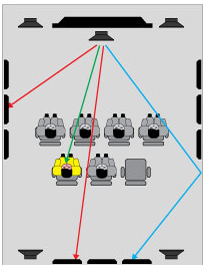 The rear end of the room (away from the screen) should contain more reflective surfaces; this helps diffuse the sound from the rear speakers more effectively. If you’d rather have an expert design and deliver the best Home theatre solution for your home, do speak to our experts in any of our experience demo centres in Bangalore (JP Nagar, KR Puram or Sanjaynagar).For address and contact details, visit www.thasmai.net and check out our great budget personalizer as well! HTA 8- The heart of your Home Theatre- The A/V receiver! Surprised at the title? Don’t be; many people assume the speakers or the projector are the most key component of the home theatre but it is the humble A/V receiver which functions as the heart of your home theatre. Preamplifier (or Preamp) – A/V receivers have a preamplifier section, which lets you select which source you’d like to listen to or watch. The options nowadays are almost limitless; from DTH, radio channels, your smartphone, wi-fi router, entertainment console or gaming device. The preamp section processes incoming audio and video signals from all your different sources, allows you to switch from one source to another, and ready the signal ot be boosted by the Amp. Amplifier (or Amp)- Simply put, an amplifier delivers thepower torun your surround speakers.Your A/V receiver contains multiple outputs, each linked to the corresponding speaker unit in your theatre, and the amount of power needed usually depends on the size of the room & the sensitivity of the speakers. Most manufacturers typically compete to provide maximum amplifier power in their products. To further know about which A/V receivers to choose, do speak to our experts in any of our experience demo centres in Bangalore. Or write to us at queries@thasmai.com with your questions and we will put our experts on the case! Main Speakers (Front Channel): TheSpeakersplaced in the forward arc of your hearing tend to carry most of the weight since a major portion of the dialogues/sounds recorded tend to be made for this channel. The front channel considers the Centre, Left and Right speakers (along with the sub-woofer). The centre speaker is usually placed below the screen, or behind the screen itself to give you the impression that the sound is coming straight from the screen (Fun Trivia: Did you know that in commercial theatres, the centre, front and right speakers are all placed behind the screen, which is why the audience in the front rows sometimes get a headache from the heavy sound). The Left and Right speakers are usually the work horses of your home theatre, and it’s recommended to have full range floor standing speakers to provide a powerful auditory experience. The sub-woofer is usually placed on the floor (as it’s a heavy unit) and handles Low frequency sounds (Bass). It is usually recommended to shift all the bass to the woofer, lending lesser load to the other speakers. Home theatres also have the option to Centre focus instead of surround sound, which will have the effect of all sounds coming from the screen, you can opt this mode for older recordings or ‘music only’ content. Surround Speakers: These speakers usually are towards the back of the viewer’s arc, adding another dimension to your hearing experience. Depending on whether you opt for 5.1, 7.1 or 9.1 (or further), the number of surrounding speakers will vary. Newer formats, such as Dolby Atmos which have upto 128 simultaneous audio tracks supported, also encourage more speakers on your ceiling (front and back) providing an even more immersive surround sound experience while watching a movie. Sound Bars: While not typically recommended for Home theatres, Sound bars offer reasonably good sound quality from a small, thin, long (wide) enclosure, with multiple speakers arranged within the rectangular space. Sound bars are usually placed below the TV or mounted on the wall below the display. To experience how these different speaker look in a typical room, do visit our experience centres in Bangalore for a free demo.